Think carefully before each selection - once a selection has been confirmed it cannot be changed! Hver runde har sin egen separate ledertavle. For å kvalifisert til en premie for runden, må du plassere minst ett veddemål eller casino innsats i runde tidsperioden. You can get a total of 8 points per game: 3 points from guessing the 1X2 and 5 points for the correct score. 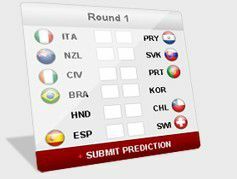 Example 1: You predict Brasil - Croatia will end 2 – 1. The correct score will be 3 – 1. You will get 3 points because you guessed it was a home win. Example 2: You predict Brasil - Croatia will end 1 – 1. The correct score is 1 – 1. You will get 3 points from guessing the draw and 5 points for the correct score so in total 8 points. Example 3: You predict Brasil - Croatia will end 1 – 2. The correct score will be 2 – 1. You will get 0 points. The prizes will be paid to your BetRedKings account within 7 days after the final results have been published. For å få premien, må du sende en forespørsel til play@RedKings.com innen 7 dager etter at de endelige resultatene er publisert. Normal BetRedKings terms and conditions apply.